Hernán Luis y Prado served in the United States Navy for 15 years as a Hospital Corpsman and then as a Surface Warfare Officer. Hernán saw three combat tours of duty In Iraq and Afghanistan, and is a graduate of the Navy Surface Warfare Officer School, where he completed the Chief Engineering Officer and Combat Systems Officer curricula. His personal decorations include the Navy Achievement Medal and Combat Action Ribbon, as well as various unit and service awards. An accomplished businessman and civic leader, Hernán was recognized by the White House as a “Champion of Change” for Workshops for Warriors’ extensive efforts and notable achievements in helping veterans successfully transition from the military into advanced manufacturing careers. In 2014, Hernán received the “Keith M. Turnham Humanitarian Award” in recognition of his military service and his continued commitment to serving the communities of San Diego. 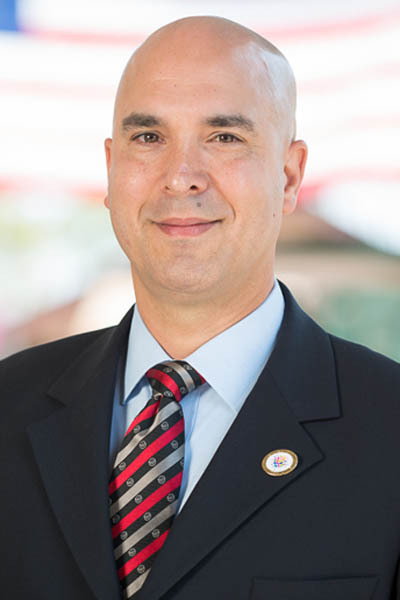 In 2015, Hernán was recognized by the California State Legislature as the “80th Assembly District for 2015 Veteran of the Year,” and more recently, “CEO of the Year” by the San Diego Business Journal in 2017. Amanda Barber is a graduate of the U.S. Naval Academy and the University of Texas and is a registered Professional Engineer (Mechanical). She currently serves as a Commander in the Navy’s Civil Engineer Corps in San Diego. Rick spent over 40 years in government and industry positions. Mr. Biben retired in late 2016 as the CEO/President of Gibbs & Cox, Inc. the leading independent naval architecture and marine engineering firm in the United States. His previous executive positions included Senior Vice President at SAIC; Vice President at CSC (now within GD); Sr. Vice President at Anteon (now GD); and Sr. Vice President at Northrop Grumman. Mr. Biben is active on a number of Boards and holds leadership roles within the Shipbuilders Council of America. Richard Eger (USN) entered defense contracting consulting after a 31-year career at SAIC—where he was Senior/Sector Vice President and Deputy President, with responsibility for 10,000 employees and $1.3B in revenues. His governance and regulatory expertise supports Workshops for Warriors’ efforts to secure federal funding. Kevin (Ed) Murphy spent 21 of his 31 years at SAIC serving as Senior Vice President for Strategic Transactions. He specialized in mergers & acquisitions, including divestitures and equity joint ventures. His expertise in finance, strategic transactions and defense contracting supports Workshops for Warriors’ strategic growth strategy. Mr. Shoemaker served for over 35 years as a Naval Aviator, retiring in 2018 following his final assignment as Commander, Naval Air Forces where he was responsible for the combat, material and personnel readiness of all aviation forces and aircraft carriers for the Navy. At Lockheed Martin, his primary responsibility is customer interface for Aeronautics product lines and services, and he also serves as a strategic advisor for emerging opportunities and integration across all business areas. Ethan Weinstein holds a law degree from Pepperdine University. He specializes in transactional law and corporate governance, and also serves as General Counsel for Workshops for Warriors. Meghan joined CNC Software, Inc., the makers of Mastercam, in 2009 and was named President in April 2015. In 2014, the Society of Manufacturing Engineers named Meghan one of the “30 Under 30 Future Leaders of Manufacturing”. She has dedicated much of her time towards the educational market and recruiting the next generation of men and women into the manufacturing industry. Peter is the Vice President, Outside Operations for Haas Automation, Inc. Mr. Zierhut’s career at Haas spans more than 33 years, with experience including management positions in manufacturing, sales, marketing, and IT. He is a senior-level manager at Haas and is responsible for oversight of Haas Automation’s HTEC-branded education program comprising more than 2000 institutions around the world that utilize Haas machine tools for educational purposes.